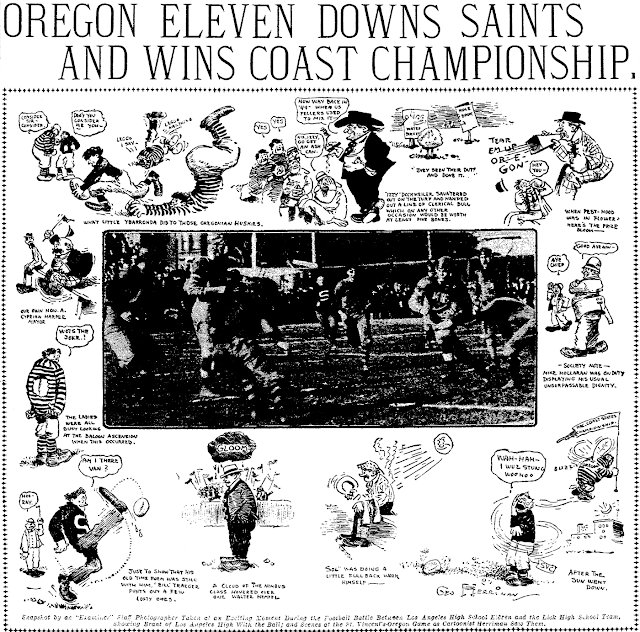 Friday, November 29 1907 -- In an odd pairing we have Herriman chronicling a college football game between St. Vincent College and Oregon State, while the photo in the middle is of a high school game between LA and Lick High School (of San Jose?). Sergeant Preston of the Yukon began as a radio show in 1939 on Detroit's WXYZ, the same station that came up with two other successful genre crime-fighters, the Green Hornet and the Lone Ranger. In this show Sergeant Bill Preston and his faithful dog Yukon King fought evildoers for the Northwest Mounted Police in the wilds of the Yukon Territories, enthralling kids on the radio for almost two decades before switching to TV where he only lasted a mere three seasons. Nothing more was heard of Sgt. Preston, whose TV cancellation seemed to be his permanent retirement, until 1981 when Lone Ranger Television Inc., the owner of the Preston brand, flush with the excitement of a Lone Ranger revival, decided to try their luck with Preston. Unfortunately the somewhat outdated story of a Northwest police officer failed to garner much interest. The best they were able to do was place a comic strip with the beyond-obscure Inter-Continental Press Syndicate. The new strip started in a tiny number of papers on September 20 1982. Art on the strip was by the ever-superb veteran cartoonist Don Sherwood and the writing was by Stan Stunell, of whom I know nothing [NB: see comments below -- evidently a real person, though perhaps not the actual writer of the strip]. If the name's a pseudonym that's a good thing because the writing is almost unbelievably awful. Stories make little sense, characters pop up and disappear constantly for no reason, and up to four different (incoherent) stories are being juggled at any given time. * the strip ends in the Seattle Times on March 16, 1983, a Wednesday, with a 'The End' announcement and a story wrap-up using pasted up art from old strips. It would be VERY odd for a paper to end an ongoing feature on a Wednesday, so I assumed this final strip was from the syndicate and did indeed signal the demise of the strip. Yet the feature was advertised in the 1983 E&P Syndicate Directory, not issued until months later. I also found original art advertised on the Comicartfans website that appears to be later since none of the strips is from a storyline in my Times run. The repro is too blurry to tell dates with certainty, but I think they are from July. 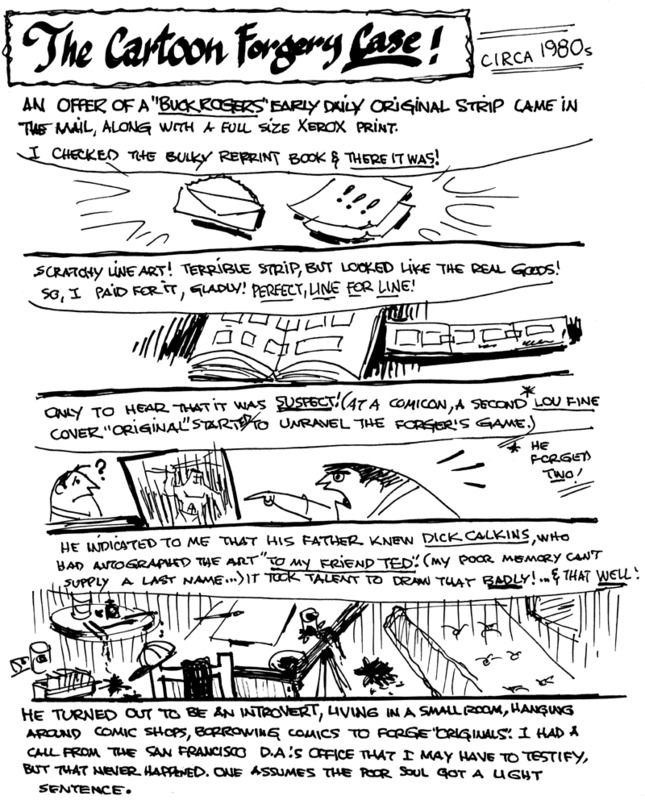 What is weirder, though, is they seem to be set in bygone days, not the modern setting of the strips I have. 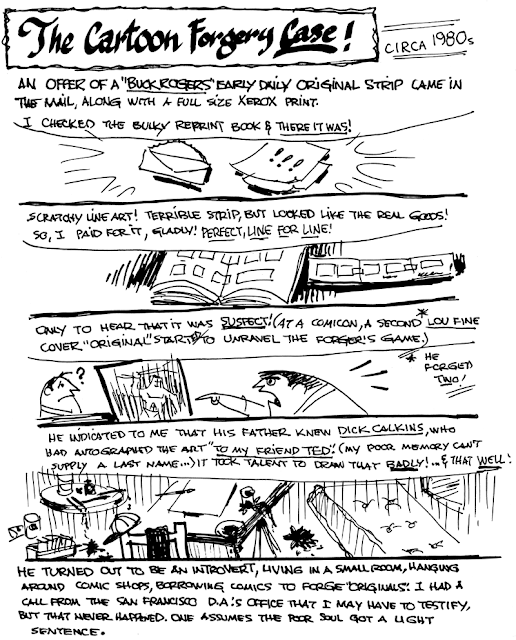 I had seen a couple of reproductions of individual Preston strips, but I thought they were demos for an unsold feature. I'm amazed that the strip actually appeared...and in the Seattle Times, which should have known better! Sherwood exhibits the same bravura work that made "The Partridge Family" comic book such a success. Why is it that when an old character is "revived", the chore is always given to someone has to tamper with the established, perhaps even beloved, aspects of the property? Here we see how Sergeant Preston, stalwart, grown-up Canadian Mountie, has been altered for the target audience of all modern poop culture: Now he's an American kid, with a hot young chick, and cool toys aplenty. (What's an ALASKAN cop doing crossing the border? Isn't the "Yukon" of the title over in sovereign Canadian territory?) I wonder if they had left it alone, it might have recieved a flicker of interest in Canadian papers, eh? -----Cole Johnson. So Sgt. Preston got the Terry and the Pirates treatment ... or was it the other way around? Yes, I remember those old issues of The Partridge Family comic that Sherwood drew. Even at seven I knew that Shirley Jones was the only good thing about that show ... Anyway, I'm impressed by the work here. Even in 1982 strips were pretty small, and I have to tip my hat to Sherwood for making this more than just another talking heads strip. It's obvious that he put a lot more work into the strip than it was probably worth. I have the original art for a September 20, 1983 Sgt. Preston of the Yukon comic strip. It contains a SUV-like vehicle. Stunell, Stanley January 24, 1930 - November 24, 2011 Stanley Stunell 81, passed away peacefully on Thanksgiving Day, November 24, 2011. He was born Jan 24, 1930 in Philadelphia, Pennsylvania. Stan was raised in England and Scotland and served in the British Royal Navy. He moved back to Chester, Pennsylvania with his mother in 1949 and then to Los Angeles in 1959 where he met and married Mildred Risk, who survives him. Stanley was vice-president, head of the film division at Wrather Corporation. He resigned in 1983 to design and build a 50 foot sailboat, which he sailed through the Panama Canal to the Mediterranean, on which they cruised for six years. In 1992 they returned to live on Bainbridge Island, Washington before moving back to Southern California. In addition to his wife, he is survived by two sisters-in-law, Mary Shook and Terry Zeoli and husband Gene. Stanley was a devoted uncle to seven nieces and nephews and their spouses, and six grand nieces and nephews. A memorial will be held in January. Stan Stunnell was head of film and licensing at Wrather. Whiole I was at The Nostalgia Merchant (177-84) we obtained the rights to all of the Wrather film holdings (Lone Ranger, Lassie, etc.) for the home video market. Stan was a gracious individual, but I am doubtful about his credit as the writer of the Preston strip. While he was a savvy negotiator, he never exhibited or even mentioned doing or exhibiting any talent for writing any script of any kind for the Wrather-owned characters. Further, the obit mentioned that he "retired" from Wrather. That isn't the way I heard it and I heard it from Stan. He was of course the Wrather executive who gave Clayton Moore a hard time in 1979, forcing him to give up the maskin his personal appearances. I've had a hankering to read this book for a long time, but the price on the used market, usually around $50, held me back. It is, after all, pretty far afield from my area of greatest interest, so I wasn't willing to shell out that kind of dough. But lately the price took a precipitous drop, as low as $10, on ABE so I finally bought one. 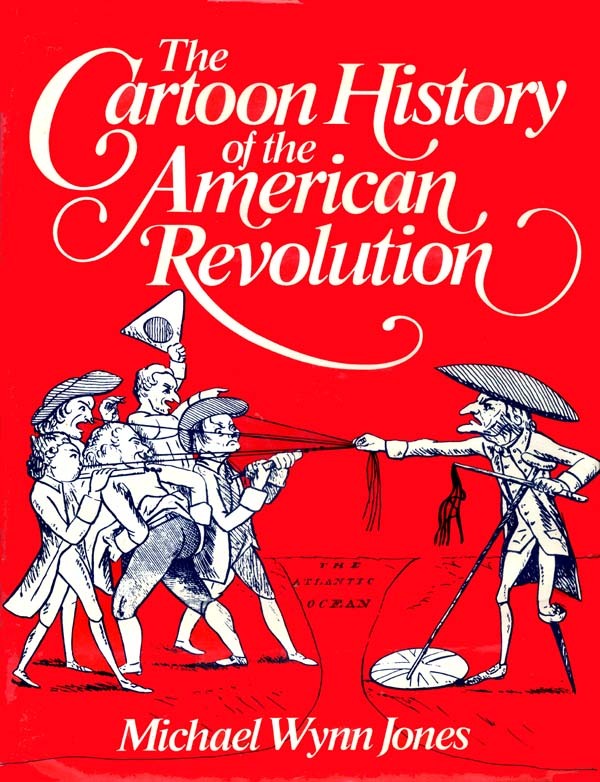 Jones does a fantastic job of giving us a concise yet full-bodied history of the American Revolution, telling the tale with the show-and-tell of contemporary cartoons. Particularly interesting is that much of the perspective comes from the British side. This is necessarily so because there were very few American period cartoons outside of the famous ones by Ben Franklin and Paul Revere. 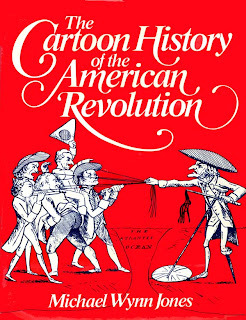 Being a Canadian who's knowledge of the Revolution is a bit sketchy, I was surprised at the fact that the vast majority of the British public, and therefore the Brit cartoonists, were against the King's war -- not so much that they sided with the colonists but that they (correctly) predicted that the British economy would suffer greatly from the adventure. As good as Jones' text is, the reproduction quality of the cartoons is pretty awful. Given the age of the source material I suppose that's not too surprising, but the often too-small reproduction certainly doesn't help any. Much of the lettering on the cartoons (and there is a lot) is indecipherable, at least to my eyes. In some cases Jones recognizes this problem and tells us what it all says, but that's the exception rather than the rule. Generally his discussions of the cartoons seem to assume more legible reproduction than he actually got. The quality of the artwork itself ranges from absolutely gorgeous (Gillray and Rowlandson, for instance) to amateurish but dynamic scribbles. If you're looking for a coffee table art book you can give this a pass, but if you are interested in seeing the state of editorial cartooning during an exciting period in history I highly recommend the book despite the reproduction problems. Harold MacGill's Hazel the Heartbreaker is essentially a mirror image of his Hall-Room Boys strip, wherein the would-be Casanovas Percy and Ferdie are always on the make with pretty girls. Here the pretty girl is the titular star, but we still have a pair of bumbling suitors who get hoist by their own petard. Hazel the Heartbreaker ran in the New York Evening Journal as a weekday strip from March 8 1910 until an unknown date in 1911, during the same period when the Hall-Room Boys were also appearing there. I wonder if readers were able to tell the difference? I notice that this strip has captions below the panels to explain the story, in apparent duplication of the illustrations and dialogue. Was this a common practice in that era? Unfortunately it was Joshua. This style is an antiquated hold-over from the 18th and 19th century style that used speech balloons merely for asides and little wisecracks, leaving the story or explication to text printed under the picture(s). Why some cartoonists continued to use the style long after others had amply demonstrated that it wasn't necessary I don't know. Hello, Jim---Back in the late 70's, I had a similar experience. A fellow in West Virginia sent me a xerox of an "original" 1929 CONNIE daily he was asking $1000. for. It looked odd, lines broke strangely, the syndicate paste-on looked shaky, the size was small...He said the copy was life-size.It would have been the right size for a '29 BRINGING UP FATHER, but a CONNIE, (and all Ledger Syndicate dailies) are as large as a gorilla's arm! I called him on it, and he feined all manner of ignorance---he said it was found at an estate auction, or something. He simply gave it to me as a "curio" (From a thousand bucks to free in a week!) It was hand-made camera obscura work, swiped from the Hyperion CONNIE book, printing glitches intact, with a hand-drawn syndicate sticker! Later I found out this guy was trying to peddle phony TARZAN, SKIPPY, BUCK ROGERS, and more at comic cons. Could it be the same hombre you encountered?-----Cole Johnson.